Joel 2:1 Sound the Shofar in Zion, And sound an alarm in My holy mountain! Let all the inhabitants of the land tremble For the day of Adonai is coming, For it is at hand. *Includes roundtrip air from Los Angeles (LAX). Other departure cities available. Arrive in Tel Aviv and transfer to your Jerusalem hotel for your dinner and overnight. First Assembly of the Sounding of the Shofars on Mount Scopus with the Malki-Tzedek Welcome, visit Mount of Olives, Gethsemane, lunch at Ramat Rachel. 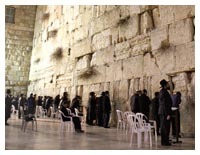 Then go to Western Wall (Kotel), Cardo, Temple Institute, Jaffa Gate, and Migdal David (Tower of David). Conclude the day with the Evening Assembly of the Sounding of the Shofars on the Old City Walls of Jerusalem. Return to hotel, dinner, and overnight at hotel. Morning Assembly convenes at the Knesset Menorah with Sounding of the Shofars. Then to the Shrine of the Book where we will view the Dead Sea Scrolls. See the scale model of Jerusalem. Bus will take us to Abu Ghosh for lunch. In the afternoon visit Yad V’shem, then to Ben Yehuda Street for the Evening Assembly of Sounding the Shofars at Tzion Square. To the hotel for dinner and overnight. Begin with the Morning Assembly with the Sounding of the Shofars and tour at Masada. Lunch at restaurant in Masada. 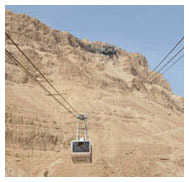 Bus to Qumran for the Dead Sea Scrolls site, then on to the Dead Sea shores and swim in the Dead Sea. Travel back up to Jerusalem and Sound the Shofars atop the Mount of Olives for the Evening Assembly. Dinner and overnight at hotel. Travel to Tel Aviv and assemble on the Tel Aviv promenade for the Sounding of the Shofars. Go to Port of Jaffa to Simon the Tanners house and the site of Jonah’s departure and his encounter with the fish. From there, visit Israel’s Independence Hall where the State of Israel was first declared a nation. Falafel lunch. Visit Ellah Valley, the site of the battle of David and Goliath, and the encounter on the Emmaus Road. The Evening Assembly Sounding of the Shofars at the Azekah Overlook. Dinner and overnight at the hotel. Morning Assembly of the Sounding the Shofars (outside the walls) near the entrance of the Kotel (the Western Wall) or the City of David. Rabbi’s Tunnel. Lunch at the Machne Yehudah market. 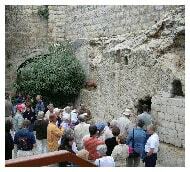 After lunch go to the Garden Tomb and partake of Seudat HaAdon (the Lord’s Supper). Erev Shabbat dinner includes Kiddush and overnight at the hotel. Morning Assembly of the Sounding the Shofars near the United States of America Embassy in Jerusalem. Visit the Pools of Bethesda. Lunch in the Old City. Go to the Panorama Overlook of the City of Jerusalem for the evening sounding of the Shofars. Return to hotel for dinner and overnight. Back to the Knesset for the Morning Assembly of the Sounding of the Shofars. Walk in the City and use Shofars as permitted/allowed. Lunch. Afternoon of teaching. End the day with the Evening Assembly of the Sounding of the Shofars on the Old City Walls of Jerusalem. Return to hotel for dinner and overnight. 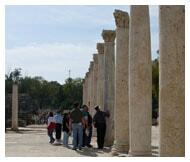 Depart Jerusalem north through the Jordan Valley, visit Bet Shean, the excavation of one of the ten Roman cities. Lunch. Journey to Yardenit for baptism. Arrive at hotel for dinner and overnight at the Sea of Galilee. 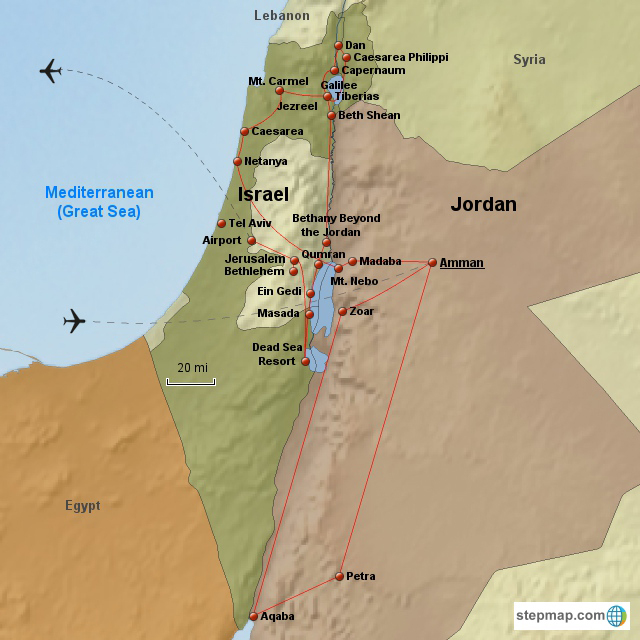 Journey northward to Kfar Nachum (Capernaum). 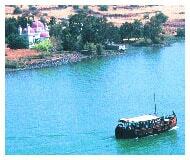 Visit the Mount of Beatitudes. Travel further north to Kfar Blum for lunch. Visit Banias (Caesarea Philippi) then climb to Mount Bental and Sound the Shofars over the junction of Israel, Lebanon, and Syria. Then make our way to the boat ride on the Sea of Galilee with time for worship and teaching on the boat. Return to hotel for dinner and overnight. Visit the excavation site of ancient Tzippori and view the amazing mosaics, then journey to the site of the Wedding at Cana, the place of the first miracle. From there, visit Nazareth, and then journey to the Tel of Megiddo and lunch. From there journey to Gideon’s Pool and Sound the Shofars. Dinner and overnight at hotel. Visit Mount Carmel, the site of the prophet Elijah, tours the theater at Caesarea and view the ancient Roman Aqueduct. Travel to Ben Gurion Airport for departure home.